Look at the 2007 Toyota FJ Cruiser and you see echoes of the classic and much-loved Toyota Land Cruiser FJ40. The FJ Cruiser not only pays homage to the FJ40, it also looks back to the beginnings of Toyota, and to the beginnings of Toyota in the USA. For not only did the Land Cruiser FJ40 help Toyota develop its engineering, production and sales abilities, but those abilities, once developed, provided the foundation for the design, production and sales of the automobile lines that followed the Land Cruiser. While the FJ Cruiser’s styling recalls the FJ40, the taproot of its family tree stretches back past the FJ40 to a vehicle called the BJ, which descends from a 1950 4×4 prototype called the AK10. The BJ was Toyota’s first 4×4 utility vehicle and was powered by the company’s prewar B-type 75 hp engine. This sturdy 3.4L six-cylinder unit, intended for use in medium-light trucks, not only was perfect for the BJ but set a pattern the Land Cruiser line followed for decades. The BJ and the famed Willys Jeep had much in common. Both were tough, square-fendered utility vehicles that consisted of basic open bodywork bolted to sturdy steel ladder frames. Both used four-wheel drive. One important difference, however, was that where the Jeep used a transfer case that offered low range, the BJ didn’t need a low range, thanks to the torque of its engine and a transmission with a low 5.53:1 first-gear ratio. As proof of the BJ’s ability to cover challenging ground, in July of 1951 a BJ piloted by Toyota test driver Ichiro Taira negotiated the trail up Japan’s 12,388-foot-high Mt. Fuji all the way to Checkpoint six, further up the mountain than any motor vehicle ever had gone. Observers from Japan’s National Police Agency liked what they saw. They placed an order for a fleet of BJs. Government forestry and utility agencies took notice and filed their own orders. Eventually 1,300 were built. It was an important and successful first step, but there was another to come. The vehicle’s BJ designation just didn’t have much poetry. After seeing the vehicle cruise over the roughest ground they could throw at it, in 1954 company officials came up with a much more musical and fitting name: Land Cruiser. Toyota had decided to begin exporting the vehicle as the Land Cruiser 20 Series, a basic 4×4 with neither top nor doors. Early recipients of 20 Series vehicles were Brazil and Saudi Arabia, which were as ready for the Land Cruiser as it was for them. Its toughness and go-anywhere capabilities immediately were adopted, and the Land Cruiser began developing its reputation. In 1955 development of the BJ concept led to the BJ25, which featured a metal top and doors, along with roll-down door windows. Amazingly, air conditioning also was available. These attempts to bring a bit of civility to the BJ signaled that Toyota had in mind larger markets than those represented by Japan’s National Police or public agencies in other countries. It intended to penetrate the civilian market. And not just with this vehicle. According to the tenets of “The Land Cruiser Strategy,” the Land Cruiser was much more than merely another vehicle to be sold. It was the point vehicle that established a base in each new country into which Toyota moved so that the Land Cruiser could be followed by Toyota passenger cars. Meanwhile the old B-series engine was being phased out of production. Its replacement was the F-type engine, a 3.8L 105 hp OHV six-cylinder gas unit. Use of that engine, starting in 1955, created the FJ25. For a time, both BJ25s and FJ25s were produced, but with the end of B-series engine production, production of BJ25s came to a close. Much of what the world knows about Land Cruisers came from the 20 Series as it was developed into an impressive variety of types designed to fit the needs of each country into which it was imported. There were the standard hardtop models, of course, but also pickups, station wagons, with long and short wheelbases, with two doors and with four. Land Cruisers quickly found their way to Venezuela, Malaysia, Kuwait, Jordan, Australia and the Middle East, where they were ideally suited to challenging driving conditions in those countries. Finally, in 1958, Land Cruiser came to the United States. Just one unit was sold in that first year. That was about to change. In 1958 Land Cruisers were known by the model-name FJ28V. But model-year 1960 brought engineering and styling changes that heralded the birth of an icon. That’s when the 20 Series took an evolutionary step into the 40-series. The familiar fold-down windshield, solid axles and sturdy leaf springs of the 25-series remained. But design revision provided the FJ40 with its now-familiar flat, white top, angular lines, wrap-around rear windows and fold-out rear doors, short overhangs, a horsepower boost to 125, a three-speed transmission and the introduction of a two-speed transfer case. The change worked, especially here in the U.S. From 1961 to 1965, the FJ40 was Toyota’s best-selling vehicle. 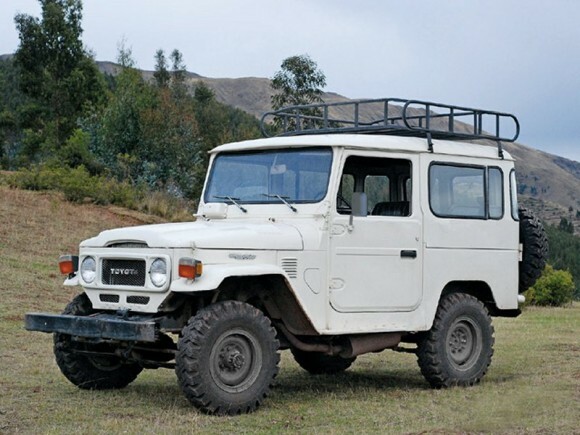 Early experience in developing countries amply illustrated the FJ40’s suitability as an exploration/expedition vehicle. Only one thing needed improvement: There wasn’t enough space in which to haul the fuel and supplies needed for long trips – this notwithstanding the presence of the FJ45V, a long, four-door version of the basic FJ40, which was built alongside the FJ40. So in 1967, responding to calls for a Land Cruiser with more comfort, more capability and more cargo capacity, the FJ45V was replaced with the four-door Land Cruiser 55 Series. The 55 Series was a development of the 40 Series, using hardware lifted from the 40 Series. But it rolled upon a wheelbase that was lengthened by 16 inches. To satisfy those looking for more comfort than available from the 40 Series’ utilitarian interior, the 55 Series offered a padded dash, a fold-down rear seat and seating for six. The payoff came in production and sales numbers that nobody – at least nobody outside Toyota – could have predicted. By 1968, Toyota had built and sold 100,000 Land Cruisers. Demand for them was so great that assembly was done in a number of countries outside of Japan, including Brazil and Pakistan. 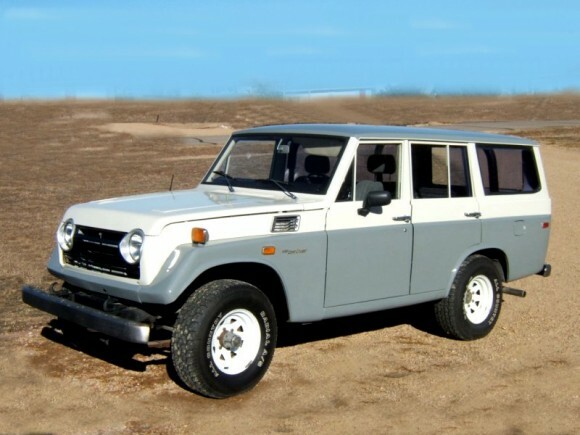 The early 1970s were years of development of existing Land Cruiser models. For instance, in 1975 all Land Cruisers received an enlarged 4.2L B-series engine and with it, a new four-speed transmission. This engine underscored the Land Cruiser’s reputation for unstoppable torque, a critical element that helped provide the Land Cruiser with its ability to crawl over obstacles on challenging trails. By now, Land Cruisers were an established part of rough-country life in the United States. For miners, ranchers and surveyors, the Land Cruiser was the vehicle of choice. In fact, in 1971 a Land Cruiser was driven the width of the United States while surveying an off-road route. By 1972, more than 200,000 Land Cruisers had been sold worldwide, and 300,000 by 1973. Hi, I noticed that you didnt mention the 70 series vehicle. U didn’t mentioned about the new engine5.7 what abou the hp/ ? Interesting history. Although I’ve never owned a Land Cruiser (hopefully, I will one day), I can say that my favourites are the FJ55 and FJ60 models. The only thing that bothers me is that neither model were ever offered with a Diesel engine in North America. I’ve only seen one in person that I’m aware of. I have a 2007 landcruiser amazon, what a brilliant motor, i will never buy another car because this one will last me all of my life.